Would you ever consider asking a landscape designer to create a garden that requires intensive maintenance? Probably not, unless you have an unlimited budget and can employ skilled professionals to care for it. Clients invariably express a preference for low-maintenance landscapes. Although no thoughtfully designed landscape is maintenance free, the level of effort required can vary dramatically from garden to garden. This article offers suggestions for keeping maintenance levels low while keeping enjoyment levels high. Some plants require more tending than others. If your goal is to reduce the time spent maintaining your garden, you should select plants that have fewer maintenance needs. Woody plants, such as trees and shrubs, generally require less fussing than herbaceous plants, such as perennials, grasses, and ferns, which often look best when cut back or divided at specific times. If these tasks are not performed or if the plants become crowded, they can lose vigor and become less attractive. Of course, many of us enjoy grasses and perennials in our gardens, but if your goal is to reduce maintenance the backbone of your garden should comprise trees and shrubs, with perennials and grasses added as accents. Once a structure is established, perennials and grasses can be added as time or interest allows. Annuals and exotic plants that are not hardy in the Pacific Northwest or that require special protection during winter also can be added sparingly to cover bare areas and add a little pizzazz to your garden beds. The trees and shrubs that form the backbone of your garden can be messy. Needles, leaves, cones, flower parts, and fruits can litter walkways and garden beds. In nature, this organic matter decomposes with the help of beneficial microorganisms and adds nutrients to the soil. The same process can occur in your garden, but a little more effort is required to keep the litter in the beds and away from hard surfaces and lawns. And in the spring you will probably need to remove much of the remaining debris to make way for more delicate emerging plants. Siting plants carefully will help alleviate some of these problems. 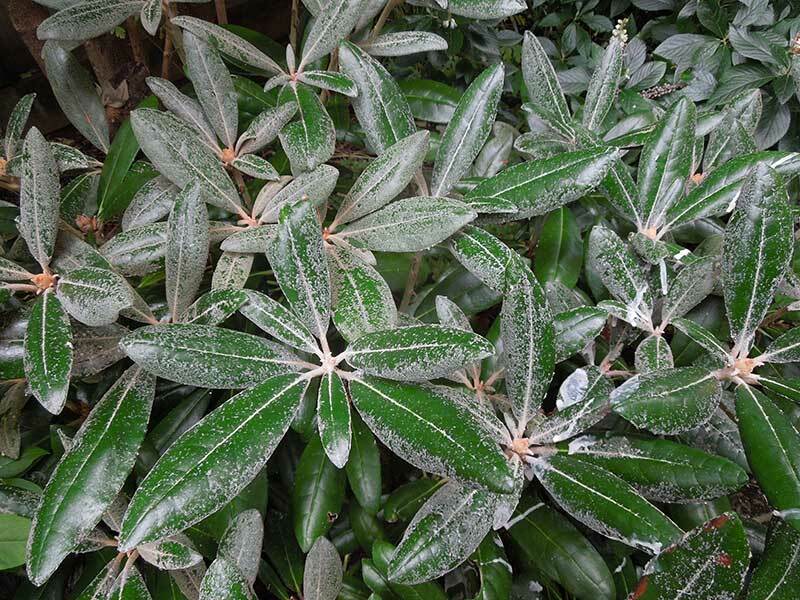 The magenta pink buds of Rhododendron ‘Crete’ are followed by lovely pinkish white flowers in April, but its handsome evergreen foliage makes the plant attractive year-round. 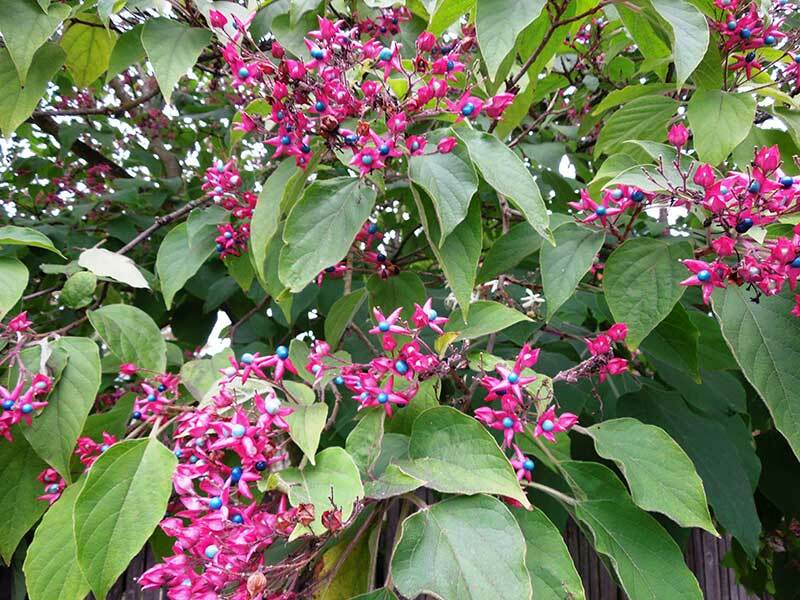 Harlequin Glory Bower (Clerodendrum trichotomum) is named for its shiny blue berries framed in hot pink that follow flowering, but this delightful feature is often overshadowed by its habit of sending underground shoots that inconveniently emerge through other plants. 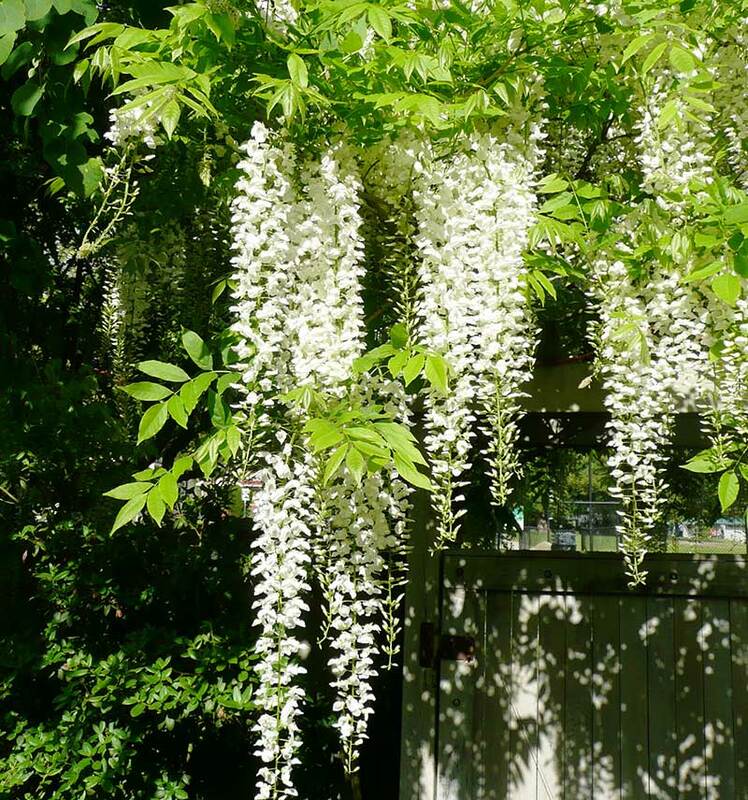 The flowers of wisteria are incomparable, but so is the maintenance needed to control the shoots it sends out during the growing season. Rhododendrons are among the tidier shrubs. In addition to being generally suitable to the Puget Sound region, they require very little shaping, and the few leathery leaves they do shed are easy to dispose of. Although their flowers are their most compelling feature, make sure their leaves are attractive as well, as that is what you will want to admire 12 months of the year. Daphne tangutica, a small shrub with dark evergreen leaves and sweetly scented pale pink flowers followed by bright red berries, provides a lot of pleasure with little effort on your part. Plants to avoid if your goal is to reduce maintenance needs include those that send up suckers from the base, such as many viburnums. Others, such as Harlequin Glory Bower (Clerodendrum trichotomum), send underground runners that are almost impossible to eradicate once they emerge smack in the middle of a treasured favorite. Some plants, such as Himalayan Honeysuckle (Leycesteria formosa) and cotoneaster, “seed around.” If the young plants are not weeded out, you will end up with a garden full of their offspring. Many vines, such as wisteria and grape, are gorgeous, but they also require attention several times during the growing season to keep their vining shoots from reaching into nearby trees and power lines. Many woody plants require no or only minimal shaping, especially if their size suits the site and they are spaced appropriately. Plants tend to look best if they have room to grow to their mature size and maintain their natural form. The arching stems of Abelia ‘Edward Goucher’ reach 6 feet. If you plant it in an area measuring 3 by 3 feet, you will either need to shear it, thereby sacrificing form and flowers (along with the hummingbirds that are attracted to them), or your planting will be a jumbled hodgepodge versus a striking combination where every plant can be admired in its entirety. Other plants with arching habits similar to abelia are varieties of box honeysuckle, such as Lonicera nitida ‘Baggesen’s Gold’, and ninebarks such as Physocarpus opulus ‘Dart’s Gold’. These are fine plants, but if you don’t have enough room for them you will be unable to showcase the traits they were selected for. Balancing form, scale, texture and color by combining a variety of different plants brings depth to a landscape, but grouping multiples of the same plant also can have a dramatic effect while simultaneously reducing maintenance requirements. The drawback of planting a limited variety of plants is that failure of any one type of plant can obliterate your landscape. But planting just one of many different types of plants creates a maintenance headache, in addition to requiring a larger knowledge base of how to care for so many different plants. Podocarpus lawrencei ‘Blue Gem’ is a wonderful small conifer that can be used as a groundcover and is as low maintenance as a plant can be. 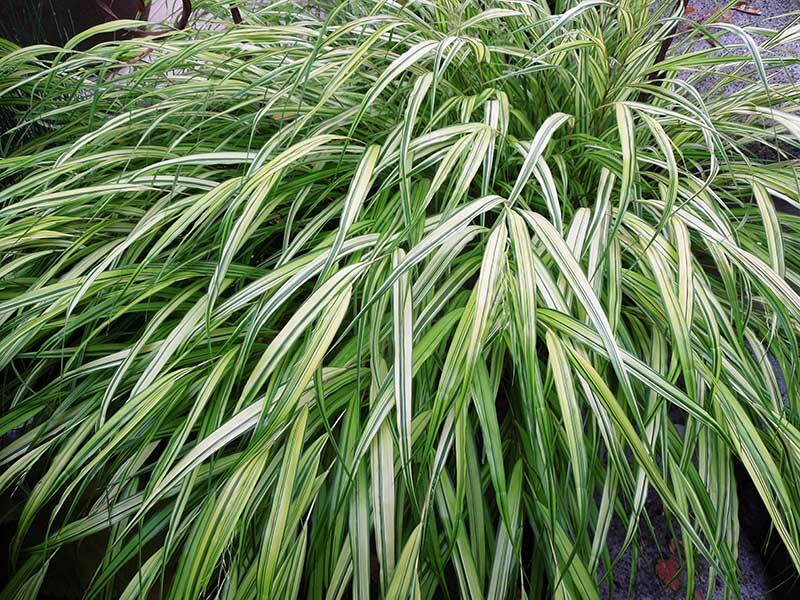 Once its grass-like leaves emerge in early spring, shade-loving Hakonochloa macra ‘All Gold’ is a star performer into fall. Our handsome and adaptable native Sword Fern (Polystichum munitum) looks best if the old fronds are removed in March so its newly emerging fronds can be appreciated, but other than that it is maintenance free. Once you’ve established a backbone of woody plants, group other plants around their bases. 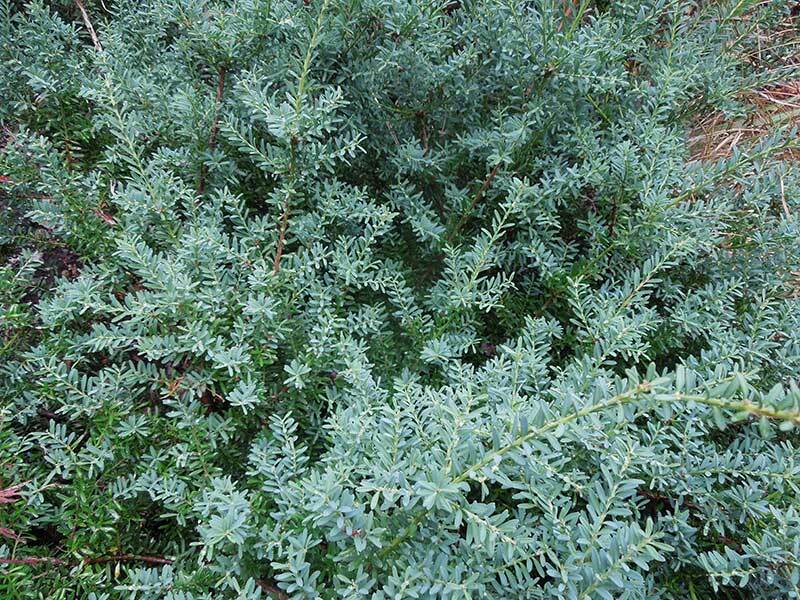 These can be smaller woody shrubs such as Podocarpus lawrencei ‘Blue Gem’, Spiraea japonica ‘Magic Carpet’, and Taxus cuspidata 'Emerald Spreader', or herbaceous plants, such as grasses, ferns, and perennials. 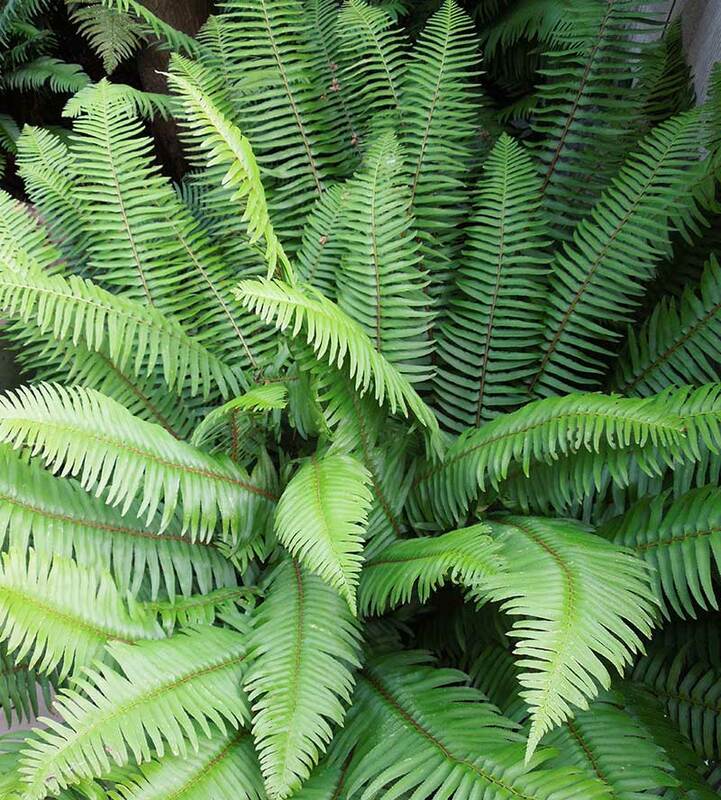 Refer to the Great Plant Picks website for help in selecting herbaceous plants, and select several from among the most reliable, such as grasses like Carex oshimensis ‘Evergold’ and Hakonochloa macra ‘All Gold’; ferns such as Polystichum setiferum and our native Sword Fern (Polystichum munitum); and perennials such as Beesia deltophylla or one of the hardy geraniums. Mat-forming groundcovers such as Sedum spurium ‘Doctor John Creech’ or Waldsteinia ternata will form the thread that ties an entire planting together while also helping to suppress weeds. Grouping plants by their cultural needs will help reduce maintenance requirements. Group sun-loving plants with other sun seekers, and shade-lovers with plants having similar preferences. Don’t site plants that need shelter from strong winds in an exposed area or plants that prefer wet feet on a parched slope. Adding organic compost to your garden beds creates healthier soil, protects roots from extremes of hot and cold, retains moisture in the soil so less watering is needed, and helps with weed suppression. Watering is probably the most critical component of maintaining an attractive—or indeed living—landscape, but it is also one of the most labor intensive. A well-designed irrigation system will enable you to water more efficiently, thereby reducing water use along with the time spent watering. In the long run it may even pay for itself. The underlying message of this article is that it is possible to reduce maintenance requirements in a landscape, but they cannot be eliminated entirely, at least not if living plants are involved. If you create a monthly maintenance schedule for your landscape, the few tasks you do need to perform can be done at the right time and in the most efficient manner. The Great Plant Picks website has lists of the best-performing plants for Western Washington. Professional landscape designers can help you create alluring, yet not enslaving, landscapes. A list of certified irrigation contractors is available from the City of Seattle’s Saving Water Partnership. Gardens are not static. A garden can be designed and installed and seem perfect, but it will change over time. There are those whose greatest pleasure derives from tending their garden. There are others, however, for whom a garden might be a pleasure, but the act of gardening is not. It is for this latter group that the suggestions in this article are intended. Although no garden is maintenance free, you need not be a slave to it either. Careful plant choices and placement, efficient irrigation, applying compost, and learning what needs to be done and when will go a long way toward keeping maintenance levels low and enjoyment levels high!